I found out that not many documentation writing about "Building VDI using Remote Desktop Services (RDS)" from beginning until the end. So I 've decided to share the configuration step by step that I have configured in my environment. I will break down into several parts as the configuration is quite long and complex. Trust me ! It's not easy and hopefully by following my step by step instruction , you will be able to deploy VDI in your environment as well. I have spent few days to perform "R and D" and finally managed to publish VDI to the Internet (Public) and user can access office environment by using browser. All you need to do is open port 443 (TCP/HTTPS) in order for user to access to the Virtual Desktop Infrastructure (VDI). I have tested on these above operating system and it work like a charm. 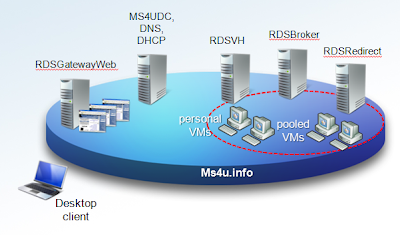 If you would like to know more about the different between Personal and Virtual Desktop Pool, please refer to http://www.ms4u.info/2010/02/revealed-microsoft-virtual-desktop.html . To make it more interesting, VDI01-Win7.ms4u.info is set to Personal Virtual Desktop and assigned to VDIUser1 which only use Office2007 whereby the Virtual Desktop Pool will use Office 2010 (Beta). The Client VM name on the Hyper V host should be FQDN and identical as the computer name in the VM. You may want to take note on some criteria to deploy personal virtual desktop . Your Active Directory need functional level running in Windows 2008. 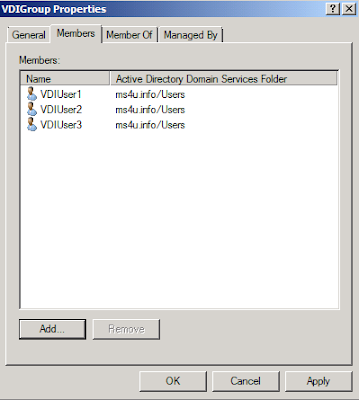 To use the added functionality provided by the Personal Virtual Desktop tab in the User Account Properties dialog box in Active Directory Users and Computers, your functional level for AD DS must be set to Windows Server 2008 R2. 7. 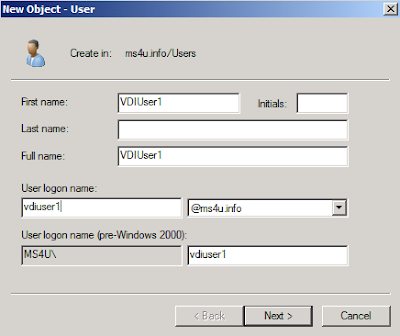 Repeat step 3 to 6 to create user account for vdiuser2 and vdiuser3. Click here:- http://www.ms4u.info/2010/03/part-2-building-vdi-using-remote.html for Part 2:- Building VDI using Remote Desktop Services (RDS). Do need to have an individual virtual machine dedicated for a single remote desktop service? and why? Anyway to configure as such that 20 VMs will share a image? Thanks in advance and thanks for the guide! Yes. 1 user per VM. But to save space, you can use dynamic disk rather than fixed disk. Hmm...for sharing 1 parent image, well not as i know of when using RDS for VDI. Thanks! When we say dynamic disk, it is similar to VMware thin provisioning correct? How about licensing? So i need a Windows Server 2008 R2 enterprise license, VDA license, and how about RDS license? Licensing is quite complex. Please contact your country Microsoft regarding license.